I don’t have any strong objection to men dressing according to the fashions of the 12th or 13th century if they happen to live in the 12th or 13th century. I assume the gentleman in the picture thought that he was looking pretty dapper. He lived in a time when the clothing fashions were perhaps a little extravagant and this fellow looks like he can afford it. My guess is that he thought he was approximating something on the side of the beautiful. I am just not willing to adopt his fashion for fear of losing the little credibility that I have left, nor have I seen anything like his clothing on the discount rack at Filene’s. Besides I much prefer clothing that covers my legs. Give me a pair of grey slacks, a Brooks Brothers tie, a navy blue jacket and I am all set- well maybe throw in a pair of Florsheim loafers, socks, white dress shirt and …well let’s get back to the point. Maybe we all have a bit of a duty to try to dress and appear in a manner that is comfortably within the range of what is commonly accepted as normal in any given time and place. But does that duty extend to making oneself look like this? Glancing at old family photos does make me wonder. Granted that I was too young to make decisions for myself, nonetheless I don’t remember exercising any sort of wholesome rebellion when my mother gave me a pair of bell-bottoms. How could I ever have consented to make myself look like that? YIKES! The seventies really were bad years for all sorts of reasons- but for me the biggest reason was that they represent a time when not only were most of us slaves to the prevailing clothing and hair fashions (which might be true most of the time) but we were all slaves to really ugly clothing and hair fashions. (well at least most of us) Scary! I think that is a very good definition. Those who do something simply because it is fashionable are slaves to fashion. Likewise, those who cease to do something simply because it is no longer fashionable are slaves to fashion. Ok. That sounds good to me. But what if my thoughts about whatsoever is true, modest, just, holy, lovely and of good fame are really dictated to me right now the way that my taste in clothing was in the seventies? For example, it strikes me that most of us pretty much follow the fashions of the day particularly with regard to what we think is lovely and what we think is true. Who among us is free from the prevailing aesthetic and intellectual views of the fashion setters? We might think that we have good taste and exercise freedom with regard to how we appear. But what about how we think? What about what we listen to? What about what we read and watch? If everyone appears to be doing the same thing within a certain margin of comfortable acceptability, is that apparent harmony the effect of free choice? This entry was posted in ad libitum, classical education, education, Liberal Arts, slavery and tagged bell-bottoms, Berquist, Brooks Brothers, Filene's, Florsheim, seventies, slavery, slavery to fashion. Bookmark the permalink. I definitely feel a “slave” towards internet use at times. But am I involved because it’s fashionable? 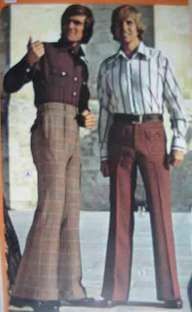 Bell-bottoms are more of a problem for women than they are for men. So when one attends a Traditional Latin Liturgy, one not only finds that many women wear veils but, if one is easily distracted by detail, one also notices that most people are dressed like they never left the forties and fifties. The question is; are these people slaves to fashion? CAN they be slaves to fashion if they have good taste?